First Sun Holliday Park solar hot water uses energy from the sun to heat water for the amenities, kitchen and laundry which minimises the need for electricity and hence reduces greenhouse gas emissions. Byron Shire is a community of nearly 30,000 people located in the Northern Rivers region of New South Wales (NSW), Australia, which in 2015 committed to transitioning away from non-renewable energy sources and to reduce greenhouse gas emissions to zero within 10 years. The community aims to be the first in Australia to achieve this goal. 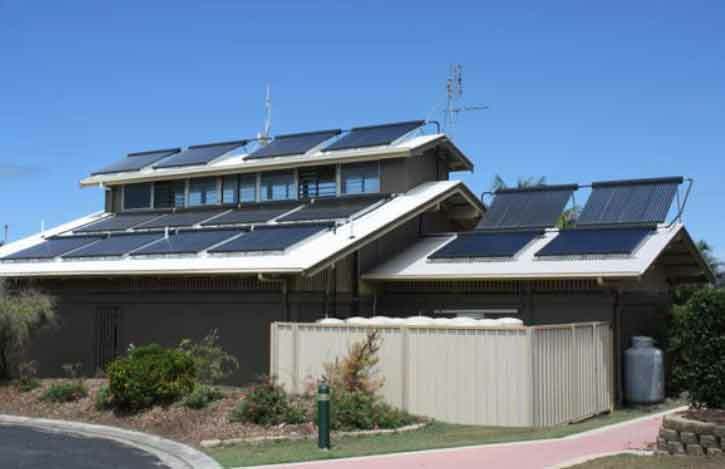 This commitment, was prompted by a visit by the think tank Beyond Zero Energy, builds on Byron Shire's Low Carbon Strategy that laid out how municipal operations could reduce greenhouse gas and protect the community from the impacts of peak oil.